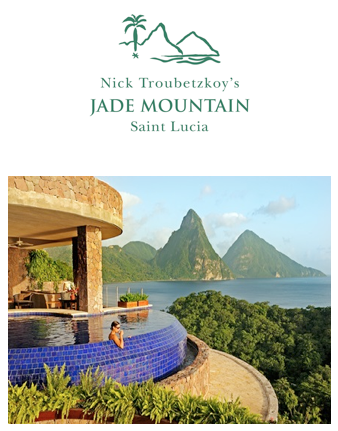 January 9, 2017 — The National Geographic Society has spoken: In their new book, The World’s Most Romantic Destinations, the authors have named Jade Mountain as the recommended hotel for the island of Saint Lucia, one of the 50 featured locales. The book is packed with more than 200 full-color photographs of cities, beaches, jungles, and spas. Jade Mountain is set on a lush, impossibly scenic 600-acre estate overlooking the Gros and Petit Pitons, 2,500-foot twin volcanoes that have come to symbolize St. Lucia and are a UNESCO World Heritage Site. The resort’s cuisine, which the book deemed “exquisite,” is overseen by the highly acclaimed chef Allen Susser, who conceived the groundbreaking Miami restaurant Chef Allen’s and has won the James Beard Foundation’s Best Southeast Chef award. National Geographic reveals 50 gloriously romantic vacations in this inspirational planner for weddings, honeymoons, anniversaries, Valentine’s Day, and other amorous special occasions. Filled with more than 200 color photographs of dreamy places—from secluded beaches to exotic jungles to luxurious spas—this book offers the perfect passionate escape to those who have just found love or are celebrating a lifetime of it.